A woman's supply of eggs is a precious commodity because only a few hundred mature eggs can be produced throughout her lifetime and each must be as free as possible from genetic damage. Part of egg production involves a winnowing of the egg supply during fetal development, childhood and into adulthood down from a large starting pool. New research by Carnegie's Alex Bortvin and postdoctoral fellow Safia Malki have gained new insights into the earliest stages of egg selection, which may have broad implications for women's health and fertility. The work is reported in the early on-line edition ofDevelopmental Cell. Bortvin's team discovered that the fetal egg die-off is connected to segments of the egg's DNA known as transposable elements or "jumping genes." As developing eggs gain the ability to guide embryo development, transposons gain the ability to start moving. These ancient virus-like genes begin to leapfrog around the egg's DNA, thereby producing new mutations, just as transposon movement causes color mutations in ears of corn. A transposable element named LINE1 is the most likely to become activated in mammalian eggs. 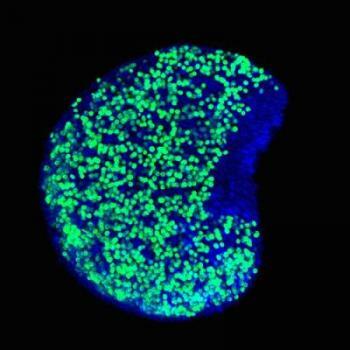 This image shows mouse fetal ovary whose eggs (colored green) were protected from dying by AZT. Blue color identifies genomic DNA in all cells of the ovary. Credit Safia Malki. Bortvin's group also discovered that the process of immature egg purging must be finely balanced. Overly stringent surveillance could result in excessive egg purging, too few surviving eggs, and premature loss of fertility. Surveillance that is not stringent enough, on the other hand, would allow eggs with a lot of jumping gene-related errors to survive, and lead to a high level of birth defects, such as those caused by an incorrect number of chromosomes in the offspring. "Our findings suggest that the ovary of a newborn girl already contains both 'good' eggs and those destined to give rise to Down syndrome or miscarriages," Bortvin said. "Further study may show that these 'good' cells are ovulated first and the abnormal ones usually come later." Finally, Bortvin and Malki's work raises the question of whether this immature egg purge is actually a blessing in disguise. Despite their destructive power, jumping genes are also the source of serendipitous genetic novelty that can make species stronger and better suited for survival over time. By allowing just the right amount of beneficial transposon-generated genetic variation, female mammals are giving their offspring and species the best chance of thriving in an uncertain, dangerous world.